Acne Treatment: Alba Botanica, Burts Bees, Logona, Derma E, Bretanna! • Gentle Acne Wash: Foamy cleanser Gentle Acne Wash penetrates deep into pores to expel bacteria and grime that cause dullness, blackheads and blemishes. The exclusive Fruit Acid Detox Fusion is combined with ten AHA-rich botanicals, Salicylic Acid and Willow Bark Extract for deep down detoxification. Rebalanced and squeaky clean, your skin will appreciate purified clarity. Hypoallergenic and non-comedogenic. 6 oz. ORDER TODAY! Active Ingredient: Salicylic Acid 1.0% (Acne Treatment). Inactive Ingredients: Aqua (Water), Lauryl Glucoside, Glycerin, Sodium Coco-Sulfate, Coco Glucoside, Sodium Lauroyl Glutamate, Stearyl Citrate, Acer Saccharum (Sugar Maple) Extract, Aloe Barbadensis Leaf Juice, Citrus Aurantium Dulcis (Orange) Fruit Extract, Citrus Grandis (Grapefruit) Fruit Extract, Citrus Limon (Lemon) Fruit Extract, Fragaria Vesca (Strawberry) Fruit Extract, Macrocystis Pyrifera Extract, Panax Ginseng Root Extract, Saccharum Officinarum (Sugar Cane) Extract, Salix Alba (Willow) Bark Extract, Vitis Vinifera (Grape) Fruit Extract, Vaccinium Myrtillus Fruit Extract, Citrus Aurantifolia (Liime) Oil, Citrus Aurantium Dulics (Orange) Peel Oil(2), Citrus Grandis (Grapefruit) Peel Oil, Citrus Limon (Lemon) Peel Oil, Citrus Nobilus (Mandarin Orange) Peel Oil, Prunus Amygdalus Dulcis (Sweet Almond) Oil, Citric Acid, Decyl Glucosdie, Glyceryl Oleate, Sodium Sulfate, Alcohol, Benzoic Acid, Phenoxyethanol, Potassium Sorbate, Sodium Benzoate, Limonene. FACE CARE: ACNEDOTE:: Oil Control Lotion, 2 oz. FACE CARE: Gentle Acne Wash, 6 oz. • Aloe Vera & Green Tea Sensitive Aloe Day Cream: Natural Sensitive Aloe Facial Day Cream is light textured for sensitive skin. Made with organic Aloe Vera concentrate and antioxidant Green Tea to alleviate red, irritated sensitive skin. Jojoba and Sunflower oils help to keep your skin hydrated and stabilized throughout the day. Non greasy formulation is perfect for acne prone skin. 4 oz. ORDER TODAY! Ingredients: Aloe Barbadensis Leaf Juice, Aqua, Vitis Vinefera (Grape) Seed Oil, Helianthus Annuus (Sunflower) Seed Oil, Glyceryl Stearate SE, Stearic Acid, Glycerin, Olea Europaea (Olive) Fruit Oil, Cetearyl Glucoside, Persea Gratissima (Avocado) Oil, Simmondsia Chinensis (Jojoba) Seed Oil, Butyrospermum Parkii (Shea Butter), Camellia Sinensis Extract, Rhus Verniciflua Peel Wax, Citrus Reticulata Fruit Extract, Citrus Aurantium Amara Fruit Extract, Citrus Aurantium Sinensis Peel Extract, Ascorbic Acid, Citric Acid, Lactic Acid, Beta-sistosterol, Squalene, Sclerotium Gum, Potassium Sorbate, Tocopherol. • Aloe Vera & Bamboo Sensitive Aloe Exfoliant: Natural Sensitive Aloe Exfoliant is particularly formulated for sensitive skin. Bamboo micro-fibers gently remove dead skin without irritating your skin. Made with refining Grapefruit to gently dissolve excess oils and organic Aloe Vera concentrate helps relieve red, irritated sensitive skin. Leaves your skin feeling soft, smooth and stabilized. Perfect for acne prone skin. 4 oz. ORDER TODAY! Ingredients: Aqua, Burdock (Arctium Lappa) Root Extract, Butyrospermum Parkii (Shea Butter), Glyceryl Stearate, Helianthus Annuus (Sunflower) Seed Oil, Glycerin, Sucrose Distearate, Copernicia Cerifera Wax, Bambusa Arundinacea Steam Extract, Citrus Grandis Peel Oil, Sucrose Stearate, Xanthan Gum, Aloe Barbadensis Leaf Extract, Tocopheryl Acetate, Gluconolactone, Sodium Benzoate, Potassium Sorbate, Sodium Phytate. FACEAloe Vera & Green Tea Sensitive Aloe Day Cream, 4 oz. FACE CARE: Aloe Vera & Bamboo Sensitive Aloe Exfoliant, 4 oz. • Leave-On Invisible Exfoliant & Blemish Remedy: Leave-On Invisible Exfoliant and Blemish Remedy Gel helps dry up blemishes in 24 to 48 hours, reduce fine lines and boost the skin's youthful vigor. Leave-On Invisible Exfoliant and Blemish Remedy Gel helps keep blemishes from developing at all, and clears away dead surface skin, and reduces bumps, roughness and blemishes anywhere on your face and body. Made with 8% Alpha Hydroxy Acid and Salicylic Acid to penetrate deeper into pores and gently dissolve blemishes and minimize fine lines. Promotes new skin without scrubbing, replenish, and moisturize. Has a natural fresh, clean fragrance of Citrus, with a hint of essential oils of Lavender, Rosemary and Geranium. 2 oz. ORDER NOW! Ingredients: Aloe Vera Barbadensis, Lemon and Passionfruit Acids, Lactic Acid, Salicylic Acid, Xanthan Gum, Clay, Extracts of Oat Avena Sativa, Calendula Officinalis, Licorice Glycyrrhiza Glabra, Vitamincells: Soy Lecithin Non GMO Liposomes with Full-Spectrum Vitamin E with Palm Tocopherols & Tocotrienols, Vitamin C Ascorbyl Palmitate, Astaxanthin, Beta-Carotene, Lutein, Lycopene, Zeaxanthin, Coq10, Essential Oils of Lavender Lavandula Angustifolia, Rosemary Leaf Rosmarinus Officinalis and Geranium Pelargonium Graveolens, Parfum. FACE CARE: Leave-On Invisible Exfoliant & Blemish Remedy, 2 oz. • Blemish Vanishing Gel Clarifying: For Normal to Oily and Troubled Skin. Instantly starts working to soothe inflammation and fight blemishes below the surface with Willow Bark and Camphor Extracts, as Fruit Stem Cells and BioActive 8 Berry Complex speeds the healing process for clearer skin in four hours. 0.60 oz. ORDER NOW! FACE CARE: Blemish Vanishing Gel, 6 oz. • Antiac Acne Clearing Spray: The award winning Antiac Acne Clearing Spray is formulated specifically for adults and children over 12 months with acne and other related conditions. 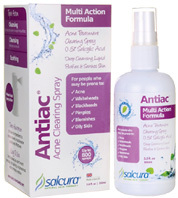 Antiac Acne Clearing Spray is for people prone to acne and blemishes anywhere on the body. Helps clear acne blemishes, acne pimples, blackheads, whiteheads, and oily skin. Multi-action Anti-bacterial formula quickly and easily absorbed to penetrate the skin intensely. Gets deep into pores to expel impurities and removes excess oil. The refined liquid penetrates into the skin, disinfecting skin pores and targeting the surface inflammation. Atomizing the liquid through a spray head means little wastage, minimal liquid use and even coverage over the skin. Non greasy. Use on all skin types. Suitable for use during pregnancy/breast-feeding. 1.7 oz. ORDER NOW! Active Ingredient: Salicylic Acid 0.5%. Inactive Ingredients: Purified Water (Aqua), Alcohol Denat, Glycerin (Vegetable), Sunflower (Helianthus Annuus) Seed Oil, Glyceryl Cocoate, Hydrogenated Coconut Oil, Safflower (Carthamus Tinctorius) Seed Oil, Isononyl Isononanoate, Sodium Cetearyl Sulfate, Cetearyl Glucoside, Cetearyl Alcohol, Grape (Vitis Vinefera) Seed Oil, Phenoxyethanol, Ethylhexylglycerin, Salicylic Acid, CI 75130, Sea Buckthorn (Hippophaea Rhamnoides) Kernel Extract, Rosemary (Rosmarinus Officinalis) Leaf Extract, Propylene Glycol, PEG-40 Hydrogenated Castor Oil, Trideceth-9, Sandalwood (Santalum Alburn) Oil, Tea Tree (Melaleuca Alternifolia) Leaf Oil, Ceteareth-25, Orange (Citrus Aurantium Dulcis) Peel Oil, Dead Sea Salt (Maris Sal), Eucalyptus (Eucalyptus Globulus) Leaf Oil, Manuka (Leptospermum Scoparium) Branch/Leaf Oil, Lavendar (Lavandula Angustifolia) Oil, Rosemary (Rosmarinus Officinalis) Leaf Oil, Olive (Olea Europaea) Fruit Oil, Sweet Almond (Prunus Amygdalus Dulcis) Oil, Peppermint (Mentha Piperita) Oil, Aloe Vera (Aloe Barbadensis) Leaf Juice Powder, Bitter Orange (Citrus Aurantium Amara) Flower Oil, Limonene, Linalool, Potassium Sorbate, Sodium Benzoate. FACE CARE: Antiac Acne Clearing Spray, 1.7 oz. • Very Clear Moisturizer: Day or night, help clear and prevent breakouts while reducing redness and irritation with this skin-balancing formula. Oily, blemish-prone skin requires extra help balancing skin oils and replenishing nutrients for clear, healthy looking skin. With an Anti-Blemish Complex of natural ingredients Tea Tree, Willow Bark, Rosewood, Lavender and Chamomile offers to be very effective on blemish-prone skin. This blend provides natural antibacterial and antiseptic properties promoting healthy, smooth and clearer skin. Regular use can help balance complexion and your skin's own oil producing capabilities to help reduce breakouts. This gentle moisturizer will help rebalance skin for a softer, smoother, more stabilized complexion. 2 oz. ORDER TODAY! Ingredients: Water (Aqua), Melaleuca Alternifolia (Tea Tree) Leaf Oil, Glycerin, Stearic Acid, Cetyl Alcohol, Caprylic/Capric Triglyceride, Salicylic Acid, Glyceryl Stearate, Lavandula Officinalis (Lavender) Essential Oil, Glyceryl Stearate SE, Glyceryl Stearate Citrate, Organic Simmondsia Chinensis (Jojoba) Seed Oil (.1%), Aniba Rosaeodora (Rosewood) Wood Oil, Organic Chamomilla Recutita (Matricaria) Flower Extract(.1%), Xanthan Gum, Potassium Sorbate, Allantoin, Organic Aloe Barbadenisis Leaf Extract (.1%), Salix Alba (Willow) Bark Extract, Cetearyl Glucoside, Polysorbate, Xanthan Gum, Phenoxyethanol, Ethylhexylglycerin. FACE CARE: Very Clear Moisturizer, 2 oz. FACE CARE: Very Clear Acne Scrub, 4 oz. Natural Kaolin and Colloidal Oatmeal Acne Treatment Mask (Sulfur 5%): Acne Treatment Mask uses the potent anti-acne agent Sulfur to cleanse and penetrate the pores, dries and clears pimples and blackheads. Helps to keep new pimples and blackheads from forming. Helps reduce irritation, block future breakouts, and renews to a smooth and healthy complexion. Purifying, Acne Treatment Mask is allergy tested, non-comedogenic (will not clog pores), and does not contain parabens, phthalates, artificial colors or fragrances. 2 oz. ORDER TODAY! FACE CARE: Natural Kaolin & Colloidal Oatmeal Acne Treatment Mask, 0.97 oz. FACE CARE: Natural Kaolin & Colloidal Oatmeal Acne Treatment Mask, 2.5 oz. • Tea Tree Blemish Touch Stick: Made with botanical extracts of Chamomile, Lavender, Palmarosa, Wintergreen and Calendula and Tea Tree Oil helps reduce oil to prevent blemishes and maintain skin clarity. Helps provide a fresh, natural radiance to your complexion. Calms and nurtures skin. 0.33 oz. ORDER TODAY! Ingredients: (Natural Grain) Alcohol Denat., Hamamelis Virginiana (Witch Hazel) Water, Melaleuca Alternifolia (Tea Tree) Leaf Oil, Aniba Rosaeodora (Rosewood) Wood Oil, Calendula Officinalis Flower Oil, Cedrus Deodara Wood Oil, Chamomilla Recutita (Matricaria) Flower Oil, Citrus Aurantium Amara (Bitter Orange) Peel Oil, Cymbopogon Martini Oil (Palmarosa), Gaultheria Procumbens (Wintergreen) Leaf Oil, Laurus Nobilis Oil, Lavandula Spica (Lavender) Flower Oil, Lavandula Angustifolia (Lavender) Oil, Melaleuca Viridiflora Leaf Oil (Tea Tree), Myrtus Communis Oil (Myrtle). • Tea Tree Oil and Chamomile Thoroughly Clean Oil Lotion: Blended with organic Chamomile and Lavender Oil, and Tea Tree Oil to help calm skin, even while improving texture and clarity. 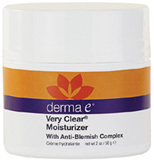 Moisturizes oily/combination skin without clogging pores, this lightweight moisturizer helps reduce oil and blemishes. Helps deliver a skin velvety smooth shine-free, resulting in revitalized and nourished skin. 4 oz. ORDER TODAY! Ingredients: Water (Aqua), Hamamelis Virginiana (Witch Hazel) Leaf Extract, Chamomilla Recutita (Matricaria) Flower Extract, Calendula Officinalis Flower Extract, Fucus Vesiculosus Extract (Bladderwrack), Hydrastis Canadensis (Goldenseal) Extrac, Hedychium Coronarium Root Extract (Hawaiian White Ginger), Caprylic Capric Triglyceride (Coconut Derived), Glycerin, (Plant Derived), Glyceryl Stearate SE (Plant Derived), Stearic Acid (Vegetable Derived), Propanediol (Corn Derived), Kaolin, Tapioca Starch, Magnesium Aluminum Silicate (Mineral), Simmondsia Chinensis (Jojoba) Seed Oil, Melaleuca Alternifolia (Tea Tree) Leaf Oil, Lavandula Angustifolia (Lavender) Oil, Mentha Piperita (Peppermint) Oil, Cymbopogon Martini Oil (Palmarosa), Citrus Reticulata (Tangerine) Leaf Oil, Helianthus Annuus (Sunflower) Seed Oil, Prunus Amygdalus Dulcis (Sweet Almond) Oil, Butyrospermum Parkii (Shea) Butter, Benzyl Alcohol (Plant Derived), Alcohol (Grain Derived), Dehydroacetic Acid. FACE CARE: Blemish Touch Stick, 0.33 oz. FACE CARE: Thoroughly Clean Oil Lotion, 4 oz. Bretanna Witch Hazel helps tone, clean and moisturize skin. May reduce blemishes from acne and other skin irritations, and prevent signs of aging. Witch Hazel Face & Body Toner Geranium Rose Hip Seed & Aloe: Enriched with Vitamins A, E, and Retinoic Acid to rejuvenate the skin and help it recover its natural tone and color. Perfect for more mature skin. • Witch Hazel Face & Body Toner Geranium Rose Hip Seed & Aloe: Dual Pack. 2.25 oz. ORDER TODAY! • Witch Hazel Face & Body Toner Geranium Rose Hip Seed & Aloe: 8.75 oz. ORDER TODAY! Ingredients: Hamamelis Virginiana (Witch Hazel) Distillate, Aloe Barbadensis Leaf Extract, Polysorbate, Pelargonium Graveolens (Geranium) Flower Oil, Rosa Canina (Rosehip) Seed Oil, Benzoic Acid. • Witch Hazel Face & Body Toner Citrus, Sage & Aloe: Made with vitamins and minerals that fortifies and invigorate the skin leaving a fresh fragrance. Helps reduce the excess oil and firming the skin. • Witch Hazel Face & Body Toner Citrus, Sage & Aloe: Dual Pack. 2.25 oz. ORDER TODAY! • Witch Hazel Face & Body Toner Citrus, Sage & Aloe: 8.75 oz. ORDER TODAY! Ingredienst: Hamamelis Virginina (Witch Hazel Distillate, Aloe Barbadensis Leaf Extract Polysorbate, Citrus Sinensis (Orange) Peel Oil, Citrus Aurantium (Orange) Peel Oil Expressed, Salvia Officinalis (Sage) Leaf Oil, Benzoid Acid. • Witch Hazel Face & Body Toner Lavender, Chamomile & Aloe: Helps calm, relax, and comfort the skin. Made with Lavender, Chamomile, Aloe, and Witch Hazel to provide cooling, firming and rejuvenating action on the skin. • Witch Hazel Face & Body Toner Lavender, Chamomile & Aloe: Dual Pack. 2.25 oz. ORDER TODAY! • Witch Hazel Face & Body Toner Lavender, Chamomile & Aloe: 8.75 oz. ORDER TODAY! Ingredients: Hamamelis Virginiana (Witch Hazel) Distillate, Aloe Barbadensis Leaf Extract, Polysorbate, Lavandula Angustifolia (Lavender) Oil, Anthemis Nobilis (Chamomile) Flower Oil, Benzoic Acid. • Witch Hazel Face & Body Toner Aloe: Contains Vitamins C and E, to moisturize skin cells, improves firmness and offer calming comfort to the skin. Use after exposure to the elements or after shaving. Suitable to those with very sensitive skin and sense of smell. • Witch Hazel Face & Body Toner Aloe: Dual Pack. 2.25 oz. ORDER TODAY! • Witch Hazel Face & Body Toner Aloe: 8.75 oz. ORDER TODAY! Ingredients: Hamamelis Virginiana (Witch Hazel) Distillate, Aloe Barbadensis Leaf Extract, Benzoic Acid. 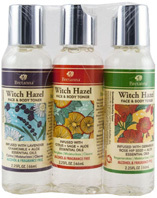 • Witch Hazel Face & Body Toner Trio Pack Assorted: Trio Pack. 2.25 oz. ORDER TODAY! Ingredients: LAVENDER CHAMOMILE TONER: Hamamelis Virginiana (Witch Hazel) Distillate, Aloe Barbadensis Leaf Extract, Polysorbate, Lavandula Angustifolia (Lavender) Oil, Anthemis Nobilis (Chamomile) Flower Oil, Benzoic Acidp) Seed Oil, Benzoic Acid. CITRUS SAGE TONER: Hamamilis Virginiana (Witch Hazel) Distillate, Aloe Barbadensis Leaf Extract, Polysorbate, Citrus Sinensis (Orange) Peel Oil, Citrus Autantium (Orange) Peel Oil Expressed, Salvia Officinalis (Sage) Leaf Oil, Benzoic Acid. GERANIUM ROSEHIP TONER: Hamamelis Virginiana (Witch Hazel) Distillate, Aloe Barbadensis Leaf Extract, Polysorbate, Pelargonium Graveolens (Geranium) Flower Oil, Rose Canian (Rosehip) Seed Oil, Benzoic Acid. FACE CARE: Witch Hazel Face & Body Toner, 8.75 oz. FACE CARE: Witch Hazel Face & Body Toner, Dual Pack, 2.25 oz. FACE CARE: Witch Hazel Face & Body Toner, Trio Pack, 2.25 oz. Ingredients: African Black Soap, Cocoamidopropyl Betaine (Coconut Oil Soap), Decyl Glucoside (Coconut Oil), Lauroyl Lactylate (Palm Kernel), Deionized Water, Butyrospermum Parkii (Shea Butter)*, Avena Sativa (Oat) Kernel Extract, Santalum Album (Sandalwood) Essential Oil, Essential Oil Blend, Jojoba Beads, Lonicera Caprifolium (Honeysuckle) Flower (and) Lonicera Japonica (Japanese Honeysuckle) Flower Extract, Salicylic Acid, Dead Sea Salt, Aloe Barbadensis Leaf Juice. Ingredients: Butryrospermum Parkii (Shea Butter), Oat Extract, Aloe Barbadensis Leaf Juice (Aloe Vera), Santalum Album (Sandlewood) Essential Oil, African Black Soap Extract (Plantain Enzymes), Tocopherol (Vitamin E). FACE CARE: African Black Soap Body Wash, 13 oz. FACE CARE: Black Soap Extract Shea Butter, 4 oz. • Organic Mint & Witch Hazel Facial Toner: The Mint and Witch Hazel Toning Lotion is blended with organic Mint Oil and the extracts of organic Sage, Rosemary, Green Tea, Magnolia and Black Cohosh to help clear and invigorate combination and blemished skin. Promotes fresh, clear complexion and clarifies the skin naturally! 4.2 oz. ORDER NOW! Ingredients: Aqua (Water), Alcohol, Glycerin, Mentha Piperita (Peppermint) Oil, Hamamelis Virginiana (Witch Hazel) Extract, Calendula Officinalis Flower Extract, Camellia Sinensis Leaf Extract, Rosmarinus Officinalis (Rosemary) Leaf Extract, Salix Alba (Willow) Bark Extract, Salvia Officinalis (Sage) Leaf Extract, Cimicifuga Racemosa Root Extract, Magnolia Liliflora Flower Extract, Mentha Piperita (Peppermint) Leaf Extract, Sodium Lactate, Lactic Acid, Maltodextrin, Parfum (Essential Oils). FACE CARE: Organic Mint & Witch Hazel Facial Toner, 4.2 oz. (3) Target blemishes with Targeted Spot Treatment. The first truly natural acne solution clinically proven to reduce and prevent acne. Noncomedogenic. Dermatologist Tested. 3 pc. ORDER NOW! Ingredients: Water, helianthus annuus (sunflower) seed oil, glycerin, stearic acid, sucrose distearate, alcohol, denat., sucrose stearate, dioscorea villosa (wild yam) root extract, punica granatum (pomegranate) extract, acmella oleracea (para cress) extract, chrondrus crispus (carrageenan) extract, lecithin, fragrance, xanthan gum, chlorphenesin, sodium borate, phenoxyethanol. • Natural Acne Solutions Daily Moisturizing Lotion: The Daily Moisturizing Lotion for acne is lightweight and clinically proven to help control oil and protect against blemishes without irritating your skin. Blended with Lemongrass, Witch Hazel, Goldenseal and Hops to calm and comfort irritated skin. Delivers a clear, smooth, healthy looking skin. Designed for acne-prone skin. Non-comedogenic. Dermatologist Tested. 2 oz. ORDER TODAY! Ingredients: Active Ingredient: Salicylic Acid (1.0%), Inactive Ingredients: Water, Helianthus Annuus (Sunflower) Seed Oil, Glycerin, Stearic Acid, Sucrose Distearate, Salix Nigra (Willow) Bark Extract, Sucrose Stearate, Cymbopogon Schoenanthus (Lemongrass) Extracthamamelis Virginiana (Witch Hazel) Water, Humulus Lupulus (Hops) Extract, Equisetum Hiemale (Horsetail) Leaf Extract, Hydrastis Canadensis (Golden Seal) Extract, Epilobium Fleischeri (Gravel Willow) Extract, Lecithin Chrondrus Crispus (Carrageenan) Extract, Fragrance, Glucose, Xanthan Gum, Sodium Borate, Sodium Chloride, Glucose Oxidase, Lactoperoxidase. • Natural Acne Solutions Maximum Strength Spot Treatment Cream: Transform from blemish to beautiful with the Maximum Strength Spot Treatment Cream. Dermatologist tested and clinically proven to help minimize and restore the appearance of blemishes without irritating your skin. Easy to apply, the natural acne treatment cream is blended with Licorice Root Extract to help reduce the appearance of redness and Tamanu Oil to help invigorate your skin. 0.05 oz. ORDER TODAY! Active Ingredient: Salicylic Acid (2.0%). Inactive Ingredients: Aqua (Water, Eau), Caprylic/Capric Triglyceride, Glycerin, Salix Nigra(Willow) Bark Extract, Stearyl Alcoholcetyl Alcohol, Glyceryl Stearate SE, Cera Alba (Beeswax, Cire D'abeille), Calophylluminophyllum Seed Oil, Cymbopogon Schoenanthus Extract, Dipotassium Glycyrrhizate, Equisetum Hiemale Extract Hamamelis Virginiana (Witch Hazel) Leaf Extract, Humulus Lupulus (Hops) Extract, Hydrastis Canadensis (Goldenseal) Extract, Lonicera Caprifolium Extract, Lonicera Japonica Extract, Simmondsia Chinensis (Jojoba) Seed Oil Stearic Acid, Sorbic Acid, Tocopherol, Xanthan Gum, Lecithin, Glucose, Glycine Soja (Soybean) Oil, Parfum (Fragrance), Sodium Chloride, Glucose Oxidase, Lactoperoxidase, Phenoxyethenol, Citral, Geraniol, Limonene, Linalool. FACE CARE: Natural Acne Solutions: Acne Regimen Kit, 3 pc. FACE CARE: Natural Acne Solutions: Daily Moisturizing Lotion, 2 oz. Maximum Strength Spot Treatment Cream, 0.05 oz. • Blemish Treatment Lotion: Blemish Treatment Lotion is a salicylic acid acne medication for the remedy of acne blemishes, pimples and blackheads. Made with Salicylic Acid and a base of natural botanical extracts to provide an exclusive lotion that will help reduce inflammation and allow the skin to heal. For External Use Only. 8 oz. ORDER TODAY! Active Ingredient: Salicylic Acid 0.5%. Other ingredients: Anti-Inflammatory Phytoamine Biocomplex, Camphor, Deionized Water, Eucalptus Oil, Lavender Oil, Menthol, SD Alcohol 40-A, Tea Tree Oil, Witch Hazel. • Facial Cleansing Gel: A very mild, non-stop cleanser for even the most sensitive skin. Works gently but thoroughly to cleanse all skin types. Its unique, natural antispetic formula actually kills bacteria better than soap, yet rinses away easily and completely without leaving a soapy residue that might irritate the skin. Natural moisturizing ingredients help leave the skin feeling soft, supple and refreshed. Contains no soap, artificial preservatives or colors. 8 oz. ORDER TODAY! Ingredients: Deionized Water, Aloe Vera Gel, Bloodroot Extract, Lauramide DEA, Vegetable Glycerine, Laureth Acetate, Herbal Extracts of [Fennel, Hops, Chamomile, Balm Mint, Mistletoe, Yarrow], Tea Tree Oil, Polysorbate 20, Herbal Fragrances, Lemongrass Oil, and Rosemary Oil, in a special extremely mild surfactant base derived from sodium and magnesium fatty alcohols. • 2 Step Home Alpha Beta Peel Kit:2-Step Alpha Beta Home Peel helps exfoliate your skin, removing the most outer layer of dull dry skin to show your new healthy skin. The peel helps even out your skin tone, reduce the appearance of fine lines, provides a healthy glow, diminish enlarged pores, and improve the general texture of your skin. Use as part of your weekly skin care. The peel has no down time and should be used weekly for optimal results. 2 pc. 2 oz. ORDER TODAY! Step 1: (In Evening) Apply the Step 1 pad with gentle, even strokes over clean and dry skin. Gently wipe pad over entire face thoroughly avoiding eyes and lip areas. Allow to absorb, wait approximately 2-3 minutes, and proceed with Step 2. Step 2: Apply Step 2 pad gently over entire face thoroughly avoiding eyes and lip areas. Allow skin to dry. Do not rinse. Proceed with moisturizer. Ingredients: Home Peel Step 1: Aloe Vera Gel, Witch Hazel Extract, Allantoin, Salicylic Acid, Chamimile Extract, Papin and Citric Acid. Home Peel Stip 2: Aloe Vera Gel, Chamomile Extract, Sodium Bicarbonate Potassium Sorbate. Active Ingredients: Salicylic Acid 5.0%, Alpha Hydroxy Acid. 10%..
FACE CARE: 2 Step Home Alpha Beta Peel Kit, 2 pc. FACE CARE: Break Out Botanical Acne Gel, 1 oz. • Pure & Clear Acne Treatment Gel: Keep Nelsons Pure & Clear Acne Treatment Gel on hand to target blemishes immediately. Acne Treatment Gel is made with the four main ingredients and Sulfur to ease red inflammation around the outbreak. 1oz. ORDER TODAY! Active Ingredients: Arnica montana extract, Calendula extract, Hypericum extract. Inactive Ingredients: Water, Alcohol, Tea tree oil, Trolamine, Carbomer, Limonene (tea tree oil source), Linalool (tea tree oil source). FACE CARE: Pure & Clear Acne Treatment Gel, 1 oz. • Acne Relief: Acne Relief Oral Drops provides the natural relief for the symptoms of clearing and treating existing acne pimples. Helps prevent new acne pimples from forming. 1 oz. ORDER TODAY! Ingredients: Active: Belladonna 6X (Nightshade), Ledum Palustre 6X (Wild Rosemary), Sulphur 6X, 12X, 30X (Sulfur), Graphites 10X, 20X, 30X (Graphite), Bromium 12X (Bromine), Hepar Sulphuris Calcareum 12X (Calcium Sulfide), Kali Bromatum 12X (Potassium Bromide), Selenium 12X (Selenium), Natrum Muriaticum 30X (Sodium Chloride) Inactive: Cellulose, Croscarmellose Sodium, Dextrose, Lactose, Magnesium Stearate. FACE CARE: Acne Relief, 1 oz. • Acne Clear: For the symptoms of acne: pimples, blackheads, oily skin, skin eruptions, unhealthy skin, teenage acne, adult acne, skin inflammation, uneven skin tone, and menstrual breakouts. 2 oz. ORDER TODAY! Ingredients: Antimonium Tartaricum, Asterias Rubens, Ferrum Metallicum, Hepar Sulphuris Calcareum, Kali Bromatum, Natrum Muriaticum, Sanguinaria Canadensis, Selenium Metallicum, Sepia, Silicea, Sulphur, Thuja Occidentalis. FACE CARE: Acne Clear, 2 oz. • Acne: Banish acne symptoms! Alleviate acne, reduce redness from broken capillaries, and inflammation the safe, natural way - from the inside out. Acne is an advanced sublingual homeopathic treatment spray to treat blemished skin naturally and effectively. Relieves symptoms related with acne, such as: pimples and blemishes, redness, itching, and inflammation. Acne also helps to prevent the occurrence of future breakouts! 1 oz. ORDER TODAY! Active Ingredients: Anthracinum 200C, Antimonium Crud 30C, Hydrocotyle 30C, Juglans Reg 6X, Kali Brom 30C, Ledium 6X, Natrum Sulphuratum 200C, Pyrogenium 30C, Radium Brom 200C, Sanguinaria 3X, Sulfur Iod 200C, Thuja Occ 200C, Urtica Ur 3X. Inactive Ingredients: Organic Alcohol 20% V/V, Purified Water. FACE CARE: Acne, 1 oz. • Acne Rescue: Safe Acne Rescue Gel helps provide fast-acting, natural relief from unsightly skin conditions such as acne and rosacea. Made with homeopathic ingredients and skin-soothing herbs helps treat pimples, redness, itching, and inflammation. Blended with Causticum and Natrum Muriaticum for the treatment of acne, rosacea, and dry, chapped or greasy skin. 0.5 oz. ORDER TODAY! Active Ingredients: Borax 30X, Carbo Vegetabilis 12X, Carboneum Sulphuratum 12X, Causticum 12X, Natrum Muriaticum 30X, Silicea 30X Other Ingredients: Aloe Vera Concentrate, Arnica Flower, Chaparral Leaf, Comfrey Leaf, Lavender Buds, Lemon Balm Leaf, Natural Plant Extract, Poke Berry, Poke Root, St. John's Wort Aerial Parts, White Willow Bark and Yarrow Flower. FACE CARE: Acne Rescue, 0.5 oz. • Normal to Oily Skin Zero Zitz! Astringent Toner: Blended with Frankincense, Lavender and Comfrey for normal to oily skin. A 100% natural combination of herbal and aromatherapy ingredients helps nurture, tone, smooth skin, and prevent blemishes. Tighten pores, remove oil, and reduce blackheads. Perfect for teenage breakouts, cystic acne, rosacea, and blemishes at any age. Never harsh or drying. Spritz generously onto face, neck, and body after cleansing. If acne is severe, apply several times per day until you see results, and then at least twice per day to maintain your clear complexion! A refreshing pore toner and excellent aftershave! External use only. 6 oz. ORDER TODAY! • Normal to Dry Skin Zero Zitz! Kreamy Kleanzer Wash: Tea Tree Astringent. For dry skin. Kreamy Kleanzer's sensuous, creamy lather is hydrating, cleansing, and toning for all-over nourishment. Helps penetrate excessively oily pores, attack bacteria, and tone and soften skin to prevent breakouts. External use only.6 oz. ORDER TODAY! FACE CARE: Zero Zitz! Astringent Toner, Original, 6 oz. FACE CARE: Zero Zitz Kreamy Kleanzer Wash, Moisture Marvel, 6 oz. • Neem Skin Care: Use as a facial mask to result in a clear complexion and healthy skin. 2 oz. ORDER TODAY! FACE CARE: Neem Skin Care, 2 oz. • Fast Fix for a Pimple: Fast Fix for a Pimple is a lightly tinted zit zapper made with Willow Bark extract and Sulfur instantly blurs the blemish and treats the main cause of acne. This 100% vegetarian formula utilizes the powers of nature to resolve your beauty emergencies. 0.7 oz. ORDER TODAY! Active ingredient: Sulfur 6.0%. Other Ingredients: Aqua (Purified Water), Isoamyl Laurate, Caprylic/Capric Triglyceride, Titanium Dioxide (CI 77891), Glyceryl Stearate SE, Cetyl Alcohol, Stearyl Alcohol, Sorbitol, Glycyrrhiza Glabra (Licorice) Root Extract(1), Salix Alba (Willow) Bark Extract, Alcohol, Alumina, Citric Acid. Glyceri, Jojoba Ester, Saccharomyces Ferment, Silica, Benzyl Alcohol, Potassium Sorbate, Sodium Benzoate, Iron Oxides (CI 77491), Iron Oxides (CI 77492), Iron Oxides (CI 77499). FACE CARE: Fast Fix for a Pimple, 0.7 oz.